The Mahatma Gandhi Memorial Foundation established the Fellowship of Peace Award to recognize the contribution and dedication of individuals toward the fellowship of peace in a variety of professions, vocations and service. Just as Mahatma Gandhi had many vocations in life and entered into many fields, his greatest work was to devote his efforts toward the cultivation of inner peace and share it with the world around him. Each recipient received a relief plaque of Mahatma Gandhi sculpted by Mr. Perry William Carsley. Mr. Carsley has produced many portraits in sculpture and painting as well as monumental art work including the National World War II Memorial in Washington, DC. The past recipients include: Ambassador Akbar Ahmed, Dr. Vibha Gupta, Mr. Rajan Devadas, Dr. Abdul Aziz Said, and Mrs. Manjula Kumar, Dr. Natwar Gandhi and Ambassador Nirupama Menon Rao. The first Fellowship of Peace Award was presented in 2004 to Ambassador Akbar Ahmed, Ibn Khaldun Chair of Islamic Studies at American University in Washington, DC, in honor of his efforts to build bridges to the culture and religion of Islam. Ambassador Ahmed is former High Commissioner of Pakistan to Great Britain. In 2005 the award went to Dr. Vibha Gupta, Director of Magan Sangrahalaya in India, otherwise known as the Center for Women and Technology. She assisted her father Devendra Kumar to establish the Center of Science for the Villages in 1976 and, since then, has been working for the development of appropriate technologies for the rural Indian population in areas like renewable energy, housing, sanitation, forest and agro-based industries, health and women‚ technology. In 2006 the award went to Mr. Rajan Devadas (a recipient of Padma Shree) for his work as a photographer and photojournalist who has linked the people and culture of India and the United States through decades of photographs. Through his own good heart and good will, Mr. Devadas has shown the beauty that unfolds before the camera. In 2007 the award went to Dr. Abdul Aziz Said, Founding Director of the International Peace and Conflict Resolution Program at American University, the Founder and Director of the American University Center for Global Peace and the Mohammed Said Farsi Professor of Islamic Peace Studies. Dr. Abdul Aziz Said was recognized for a life-long dedication to peace making and peace education. In 2009 the award went to Mrs. Manjula Kumar for her efforts to build bridges of understanding through the arts. Her work with the Smithsonian Institution, Washington, DC, Global Performing Arts, and the Washington International Film Festival actively engages both her cross-cultural efforts and the arts. 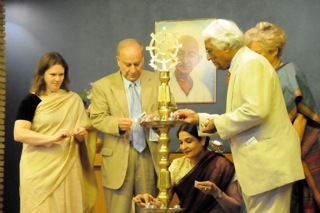 In 2013 the award went to Dr. Natwar Gandhi for his exemplary Gandhian service as a public servant in the District of Columbia and through his efforts in the DC community. In 2018 the award went to Ambassador Nirupama Menon Rao for her lifetime work toward peace and cultural understanding through diplomacy and the arts.